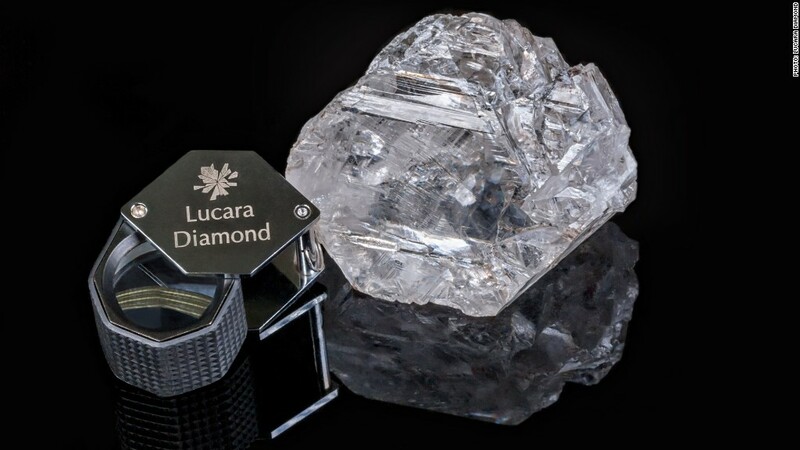 Ten days after unearthing the biggest diamond in a century, Canadian mining company Lucara is still unable to put a value on the enormous stone. Despite reports it could be worth "north of $60 million," CEO William Lamb told CNNMoney it's too early to know and the company has made no estimate yet. Diamonds aren't just priced by the carat, Lamb said. The value is also based on the interest in the market, "the illusion that stone actually carries," he said. Lamb has received one email offering $40 million, and some analysts have estimated the 1,111 carat gem to be worth about $66 million. But before a true sense of the gemstone's value can be established it will have to be examined in person by prospective buyers, he said. That's because the gemstone is so large that it does not fit into conventional scanners used to evaluate a stone's potential worth. These state of the art machines evaluate a stone's clarity, color and internal fractures, and ultimately can determine how to cut a diamond for maximum value. But with this gem -- the second biggest ever found and the largest since 1905 -- prospective buyers will have to turn back the clock and use their knowledge, and eye, to arrive at an estimated value, said Christopher Gemerchak, editor of The Diamond Loupe, an industry publication. This is likely to take place in Antwerp, Belgium -- the heart of the diamond trade -- where "the people with the greatest expertise are located, as well as financiers who work with the evaluators and ultimately determine if, and how much, they would bid," said Gemerchak. The 1,111 carat diamond was recovered from a mine in Botswana. The value will also be determined by the government of Botswana, where the gem was discovered, Lamb said. Botswana gets a 10% royalty on the value of all precious gems mined on its territory, and it levies a 10% export tax on minerals. Lucara (LUCRF) found the stone in its Karowe mine in the southern African nation. The company paid just $49 million in 2009 to buy a majority stake in the mine from a consortium led by De Beers (NGLOY). 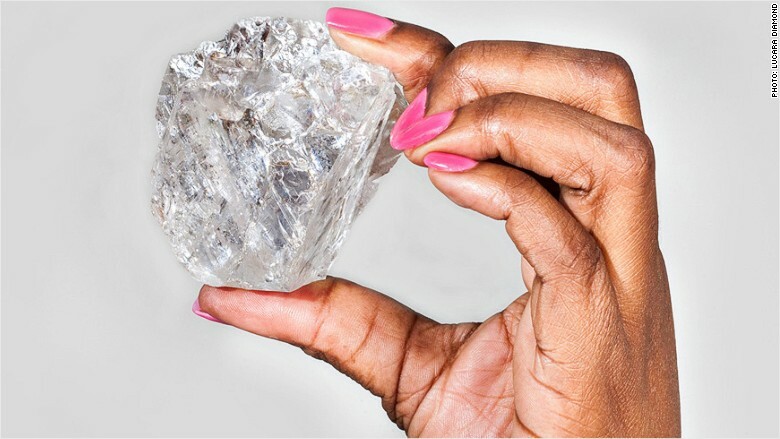 Botswana produced $3.6 billion worth of diamonds in 2014, second only to Russia, according to industry data. The World Bank estimates that Botswana's mineral revenues will rise 16.7% in the current fiscal year, even though diamond production has fallen in three consecutive quarters due to weaker demand for diamonds on the global market. Lucara said last week it also uncovered two "exceptional" white diamonds, estimated at 813 carats and 374 carats, at the same mine. "It would not be the best strategy to put all three on the market right away," Lamb said in a conference call last week. Gemerchak said Lucara could sell the stones to a private buyer or jeweler, or put them on display first to generate interest.